May 27, 2008: Back on April 13 I returned to Ontario via the W. Virginia side of the Ohio River. This time I took the road on the other side of the river to see what I could see. On May 22 my contract with Toyota of North America (TEMA) ended and I returned back to Kentucky. In the meantime, Toyota of Canada has requested that I come up for another month to assist the Aeembl maintenance team in their training, so this trip was my return. Last week I closed out the apartment I was renting in Paris, so for the next month I will be staying at the Quality Inn in Woodstock, which is a nice comfortable place to stay. I left Lexington early, around 6:30 AM and this time I had decided to go through Paris, KY...just so I can add it to my "Paris collection". Having just spent the last few months living in Paris, Ontario, I thought it would be fun. So, here I have "A Tale of Three Paris's." There are apparently 10 cities named Paris in the United States (see this link). 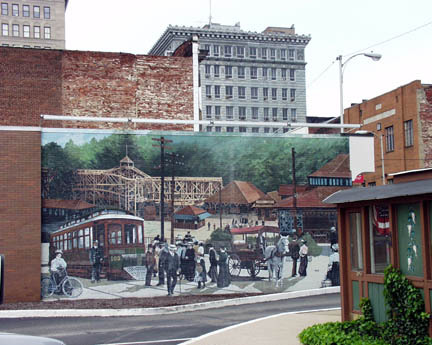 Paris, Kentucky: Settled in 1775, on the Stoner Fork of the Licking River. 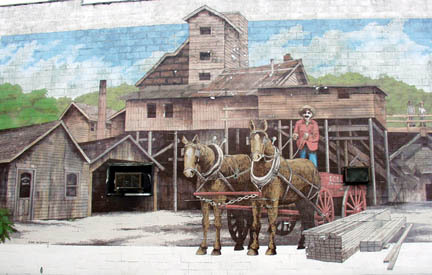 The town was originally known as Hopewell, Virginia when it was chartered in 1789. The name was changed in 1790 to reflect appreciation for French assistance during the Revolutionary War. Its tourism motto is "Horses, history and hospitality". Paris was first chartered as a city in 1862. 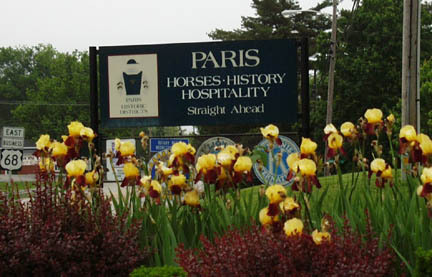 Paris is home to Xalapa Farm and Claiborne Farm, prominent thoroughbred race horse breeding operations. Triple Crown winner Secretariat retired to Claiborne Farm and is buried there, as is the immortal Buckpasser. 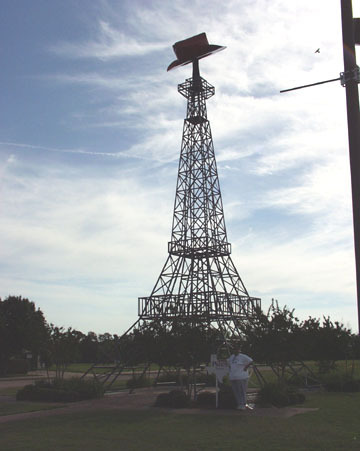 Paris, Texas: This Paris us located 98 miles (158 km) northeast of the Dallas–Fort Worth Metroplex. 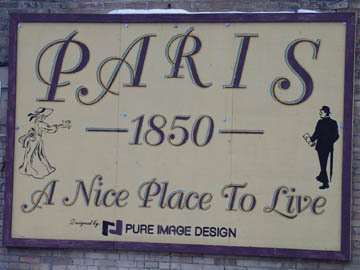 Local residents like the humorous slogan "Second Largest Paris in the World," and along these lines a (smaller) duplicate of the Eiffel Tower (see photo of me with the tower at left), which in recent years has completed this lampoon with a giant red cowboy hat. The current tower is at least the second copy of the Eiffel tower built in Paris. 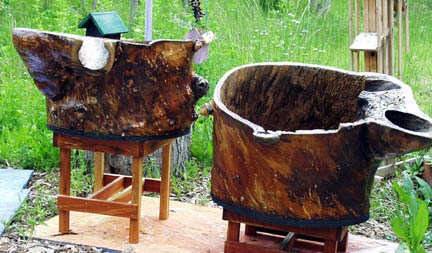 The first was constructed of wood, but was destroyed by a tornado. 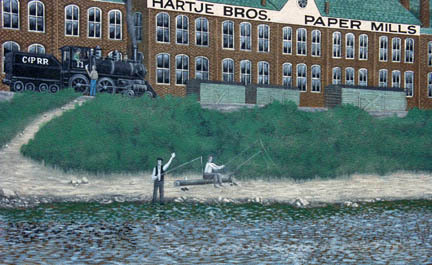 The first recorded settlement in the vicinity was in 1826, and settlements were known to be in the area as early as 1824. 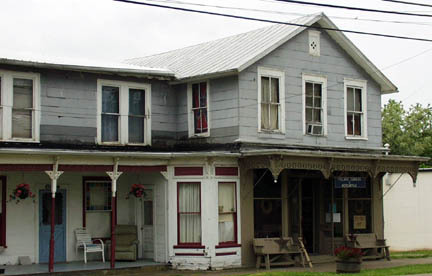 The town was founded by merchant George W. Wright, who donated fifty acres of land in February 1844, when the community was also designated the county seat. 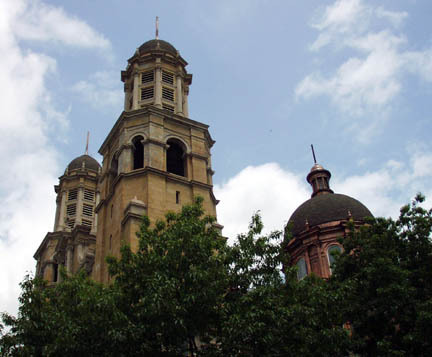 It was incorporated by the Congress of the Republic of Texas on February 3, 1845. 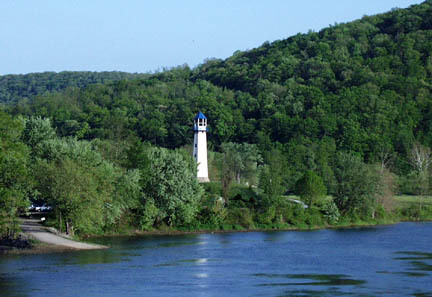 The community has no factual knowledge of who named the town, but it is assumed it was named after its French counterpart. After leaving Paris, I continued northeast on US 68 heading towards Maysville. My first stop was at Blue Licks State Park. 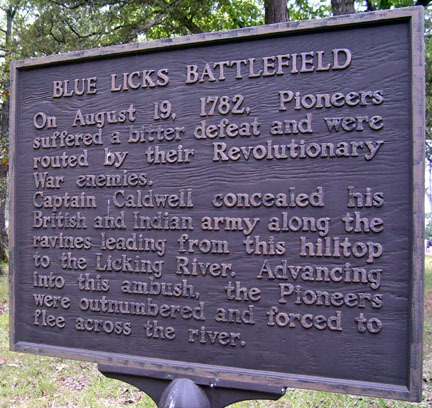 This was the site of The Battle of Blue Licks, fought in Kentucky on August 19, 1782, was one of the last battles of the American Revolutionary War. The battle occurred ten months after Lord Cornwallis's famous surrender at Yorktown, which had effectively ended the war in the east. 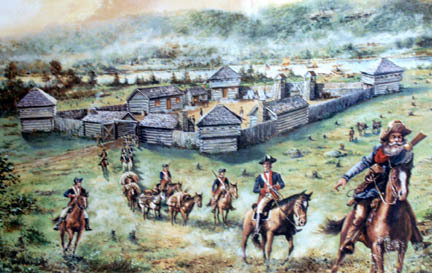 On a hill next to the Licking River in what is now Robertson County, a force of about 50 British rangers and 300 American Indians ambushed and routed 182 Kentucky militiamen. It was the worst defeat for the Kentuckians during the war. 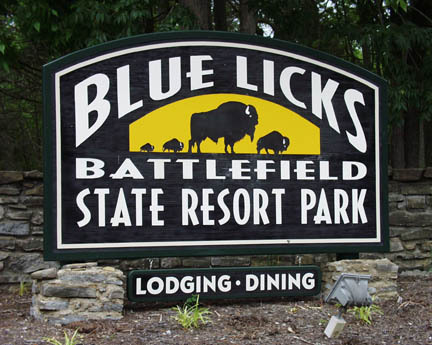 Blue Licks Battlefield: I drove up but everything was still closed. I continued towards Maysville. Along the way, just before I got to Washington, KY, I came across a couple of Amish carriages. I have grown to enjoy seeing these folk out on the road living a slower paced life. I continued and came across the historic town of Washington, KY. This was an unexpected surprise for me. 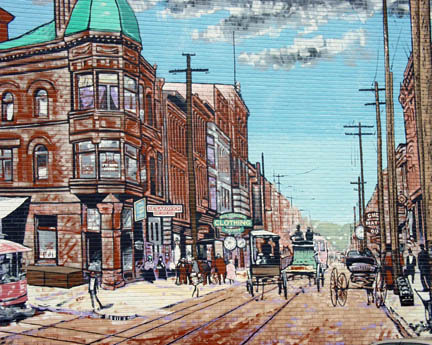 There is a little turnoff and then you can drive up past a number of old historic buildings. What I didn't know was that in the late 1700's it was one of the largest communities in Kentucky. It is places like this that make these backroads trips a joy. This is the Washington Post Office. 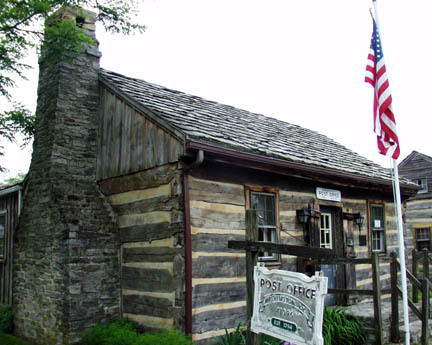 They claim that it is the only functioning Post Office in an old log cabin. It is been in operation since 1786. According to the plaque on the Post Office, this was the first established U.S. Post Office in the then Northwest Territories. 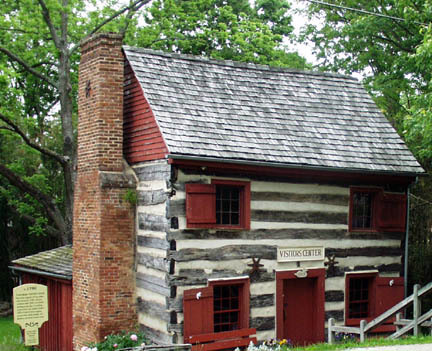 The Washington Visitor's Center (which was closed when I got there), is listed as one of the original 119 log cabins that existed in 1790 Washington, KY. This Limestone house was built ca. 1799. According to the sign, the walls are two feet deep. 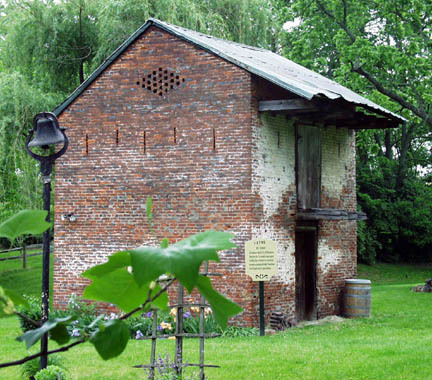 This type of construction was the precursor to brick home construction as an evolution away from log cabins. 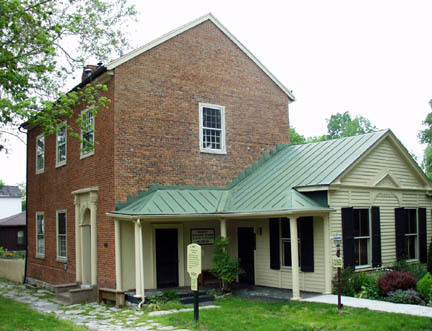 This is the Marshall Key House, now home to the Harriet Beecher Stowe Slavery to Freedom Museum. It was built in 1807. 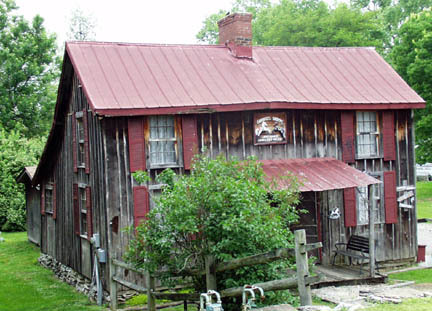 This building is located behind the Stowe Museum. It was called the "Indian Fort" and was used as protection against Indians. The thin slats in the brick wall were for the guns to be used. 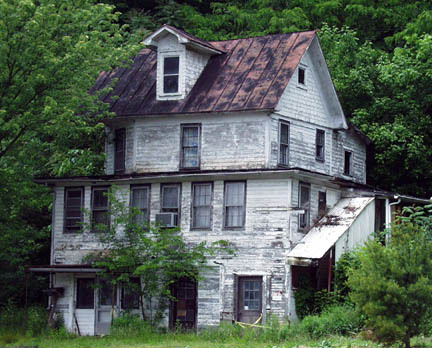 I just liked the looks of this old house. 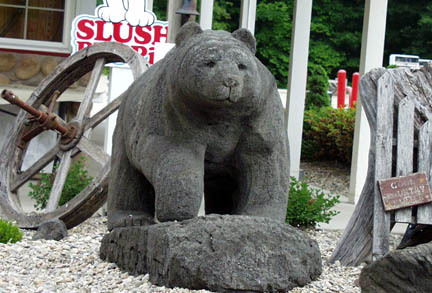 It is currently the home of the Carousel Shoppe Antiques. I couldn't find anything about this place. After crossing over the bridge I headed east on Ohio 41. 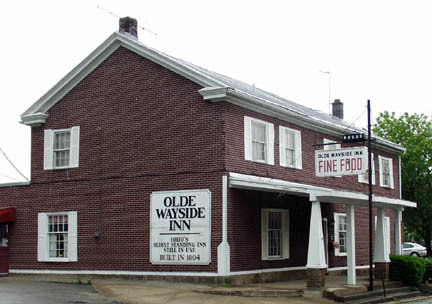 I came into West Union, Ohio, which is home of The Olde Wayside Inn, which they claim is "Ohio's Standing Inn still in use". 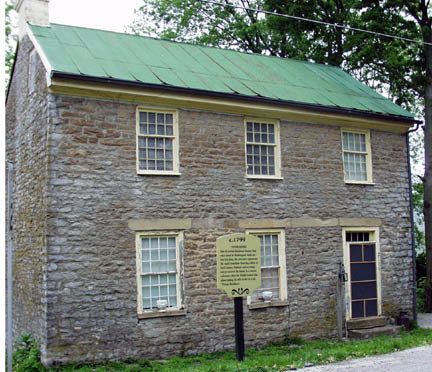 Built by General David Bradford in 1804 and was known as Bradford's Tavern. The inn is of log construction. 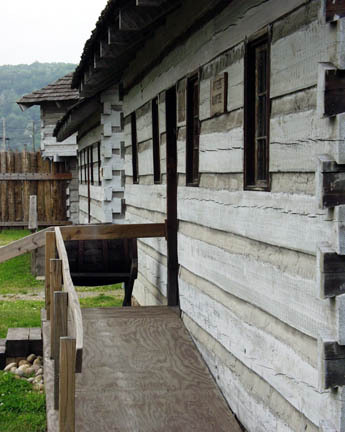 General Andrew Jackson, Senator Henry Clay and Mexican President Santa Anna were entertained here. The Olde Wayside is still used today providing five sleeping rooms and offers home cooking. I also a unique BBQ place - JT's Stovetop BBQ. 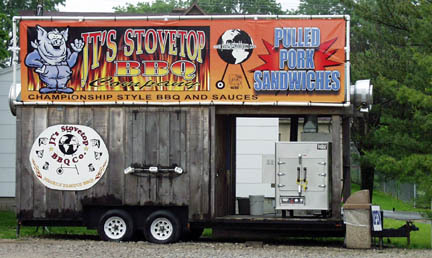 Like my favorite BBQ Place, Camp 31 in Paris, Ontario, JT's claims to have won a number of BBQ competitions. Don't know, since I couldn't try them (they were closed), but they did have a unique trailer. I continued northeast on 41 through Peebles, OH and then into Locust Grove, OH. 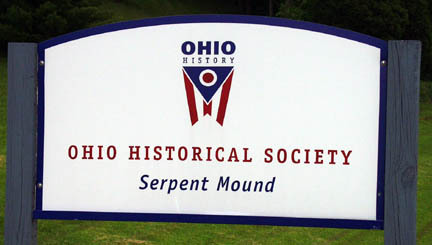 I noticed signs for the "Serpent Mound" State Park (also see this link), so I deviated off the path and headed up Ohio 73 about 7 miles to the park. As with everything else, it was closed, but I was able to drive up the road. Every since I was a tour guide for Nava-Hopi Tours in Flagstaff, AZ in the early 1980s, I have been fascinated by the Indian cultures. Of course, on my last trip up the W. Virginia side of the Ohio River I stopped at Moundville, home of another huge burial mound. 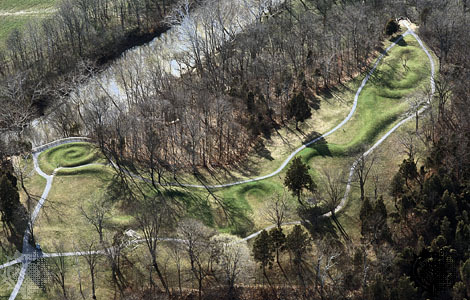 The Serpent Mound is an effigy of a serpent or snake that stretches and winds about a quarter of a mile. I did make it up to the parking lot, but was not able to access the site as I was too early. SO, I snatched an aerial photo from the internet. On the way from Locust Grove I noticed a place that I had to return to. 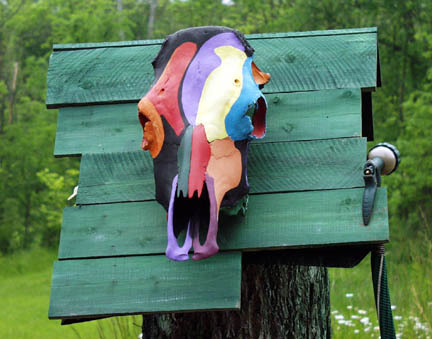 It is another of those unique, yard art types of places. I knew I would be returning back to Locust Grove, so I hit this place eon the way back. 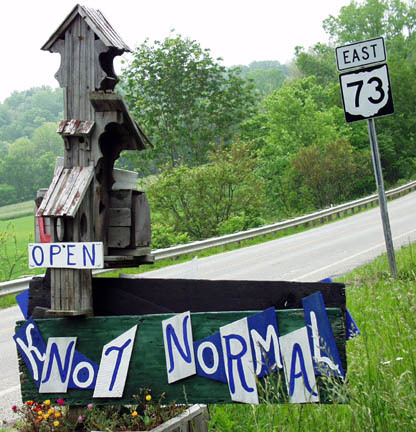 It is called "Knot Normal" and indeed, they even have a website. 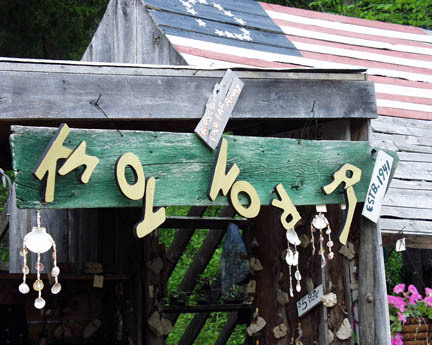 This place was also closed (as far as I could tell anyway), but I did drive in and grab look-see at some of the hand made wooden crafts, birdhouses and the unique nature of the place. The work is typical of much of the other folk art I have documented elsewhere in my journals (see all of the other links at the bottom of this page). The creativity of people never ceases to amaze me. 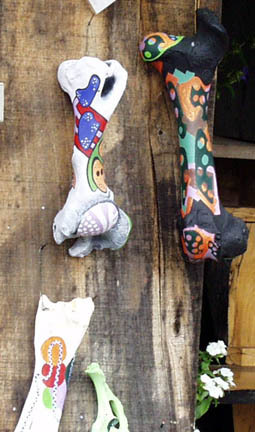 Painted bones, stump containers and bird houses...all individually crafted at Knot Normal. My favorites. 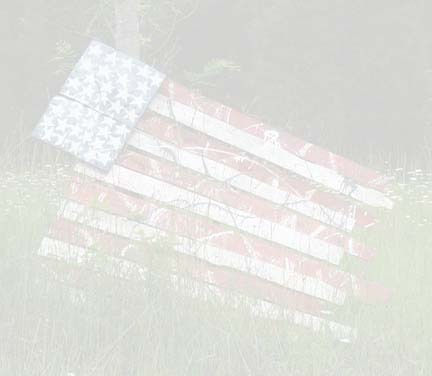 The painted skull was great, but the flag was astounding to me. I love this photo. After this roadside surprise, I was back on the road to Locust Grove and then continued south on 73 to Ohio 32, which is also called the Appalachian Highway. This is a 183 mile, mostly 4 lane expressway that crosses through Ohio from Cincinnati east all the way to Belpre. I would be following it basically all the way to Belpre. After about two hours of driving I arrived in one of my "planned" destinations...and only for one reason, I loved the name. I got into Coolville, OH at 11 AM. 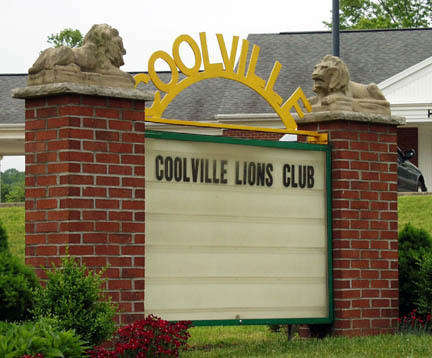 There is really not too much about Coolville that strikes the senses, but the name is pretty cool...dude. 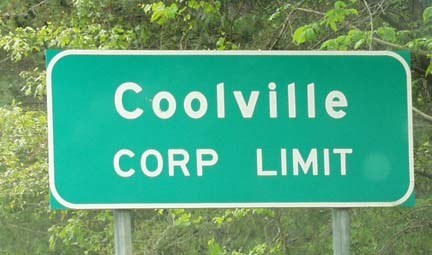 In the 2000 census there were about 530 people living in Coolville. 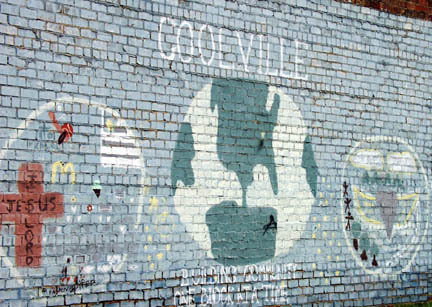 One thing I found out in my research is that Coolville was named after Ashel Cooley. That name is insignificant to me except that the genealogist in me wants to know if this Cooley is anyhow related to the Cooley family on my mother-in-law's side. Her mother was a Cooley. I guess I will need to do some research. After a quick break at the Cool Country gas station, I continued up the road. 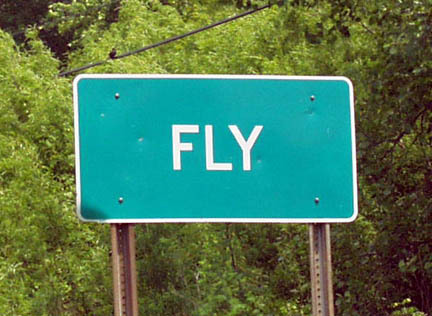 Just a few miles up the road to the next village and yet another interesting town name. 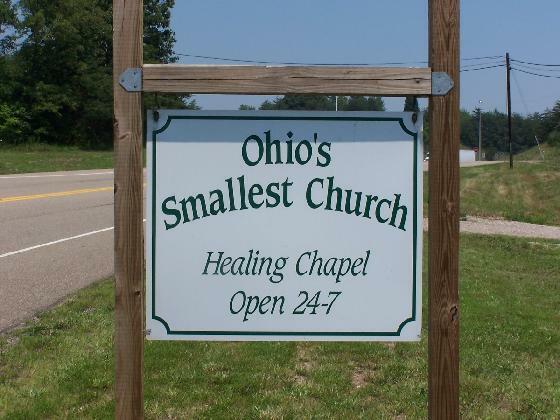 Along the road was a rest area with a sign noting that Ohio's Smallest Church was here. I stopped in for a visit. 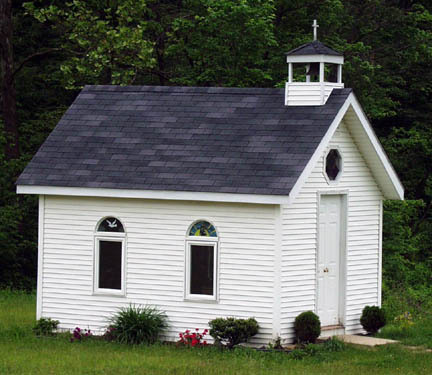 The church, called "The Healing Chapel" is truly small...it is 10 feet by 14 feet and as four small pews inside. 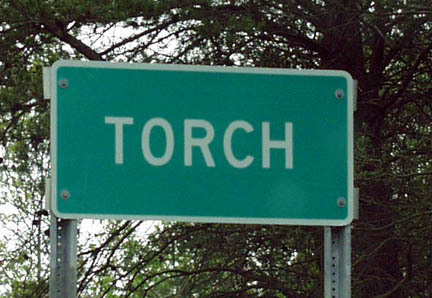 I had arrived in Torch, OH. From Coolville to Torch - HA! 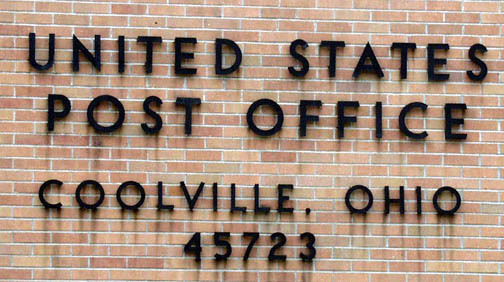 (Ironically, the first town north of Coolville on Ohio 144 is called Frost...I did not go there). I could not find anything to provide information as to how Torch got its name. As for the little chapel in Torch, I did some research and came to find that it was built by Lloyd Middleton of Coolville. Lloyd Middleton and his wife were the founders of the Lloyd Middleton Doll Company. Their dolls are apparently sold on QVC. Originally owing a shop in Belpre, they sold it and moved it to Torch. Then, as an article I found on the internet states, when the decision was made to sell the Belpre store, and build in Torch, Ohio, Janice began to see visions of God using their spiritual calling in a much more compelling way. Janice saw the property adjacent to the State rest stop becoming an evangelistic outreach to their ministry together in touching many more lives than they had previously considered in the previous market place. During Janice’s prayer time, the Lord spoke to her about calling the property at Torch, the ”Promised Land”, building a miniature chapel for traveling visitors where Lloyd would be available to minister. 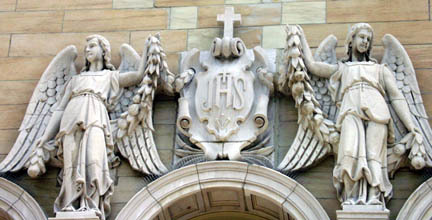 When Janice shared her vision with Lloyd, they prayed and decided to name the Chapel "The Healing Chapel". It turns out that through a series of incidents, they purchased the building, which sat on a property in Glouster, OH, about 40 miles from Torch. The couple that owned the building donated it to the Middletons and then all worked together to get the chapel moved to Torch. The non-denominational chapel is open 24/7 and anyone can go in to pray and seek respite. 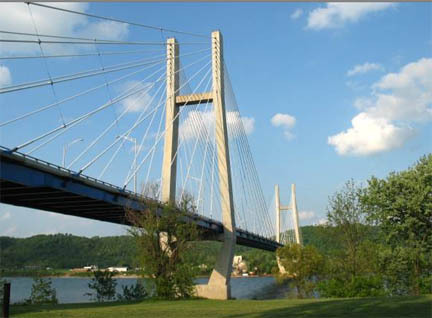 One of the reasons I wanted to make this trip was the beauty of the scenery along the Ohio River. Here are a few of the riverine landscapes. 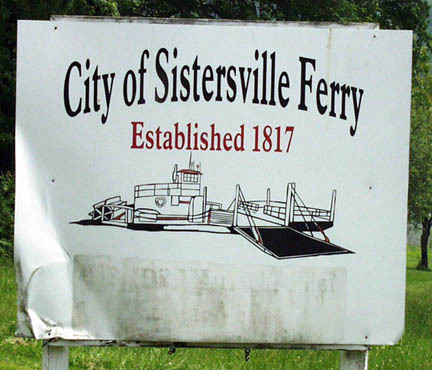 Near Fly, OH (yes, another unusual name) I saw a sign for a ferry to Sistersville, a town I went though in April. 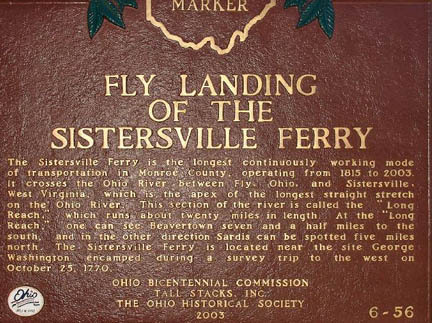 This is the longest continuously working mode of transportation in Ohio, having been established in 1817. 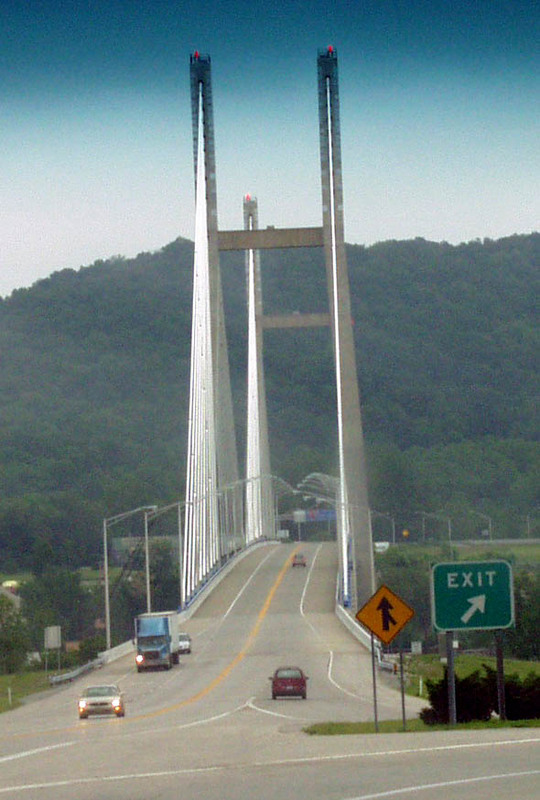 This crossing is at the apex of the longest straight stretch of the Ohio River (abt. 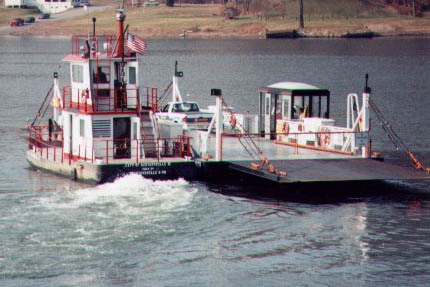 20 miles), called the "Long Reach". Along the way I found another old house in Powhatan Point, as well as a unique sign for the town. I continued north along the river finally getting into Bridgeport, across the river from Wheeling, WV and continued north from there on the Ohio side of the river. 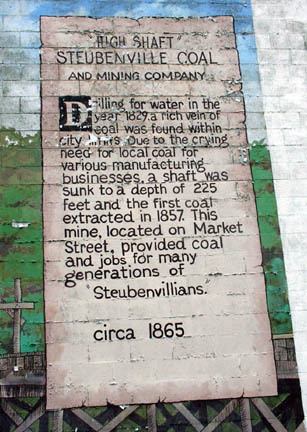 I went through many small towns (including Brilliant and Toronto) finally arriving in the old steel town of Steubenville, OH, which was one of the places I had planned on going to. 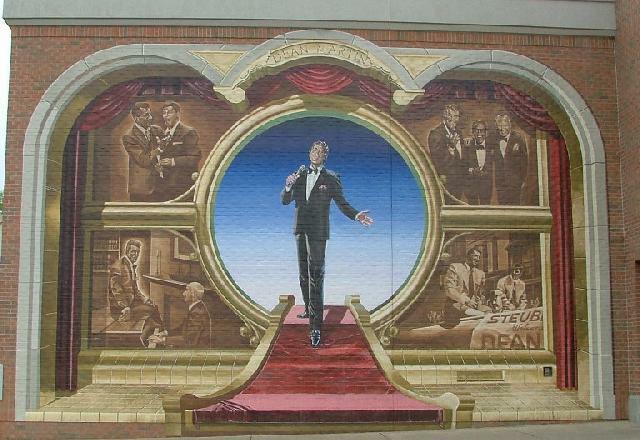 This is the hometown of the famous actor/siniger Dean Martin and is known as the City of Murals, with over 25 larger than life murals painted on the sides of buildings around town. The town of over 20,000 seems to be one of those dieing steel towns. As I drove around town I got a sense of sadness. 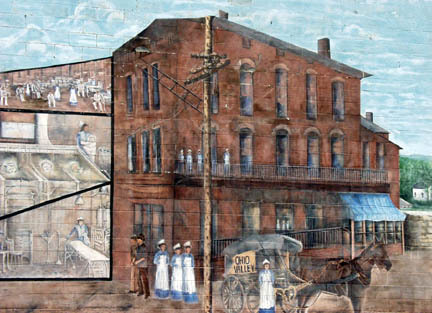 Many old crippled folks hobbling along the streets and many of the downtown businesses were welfare-related businesses. Up on the hill above the city there seemed to be a little more life. 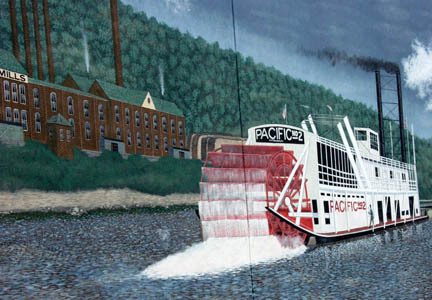 But, I also saw obvious signs that the town is trying to redefine itself as a historical tourism location with the murals, a new museum dedicated to the Old Fort Steuben and then the Ohio River scenery of course. 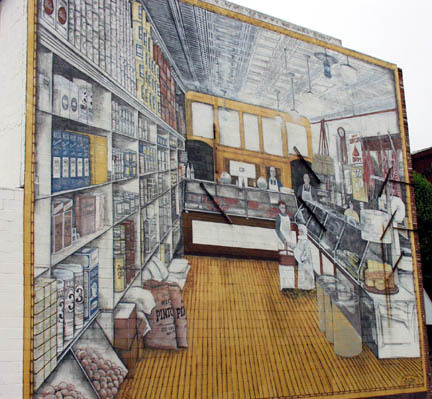 So, to start off with, here are a few of the murals I found as I drove around. I did not get a map as I wanted to explore and discover on my own. 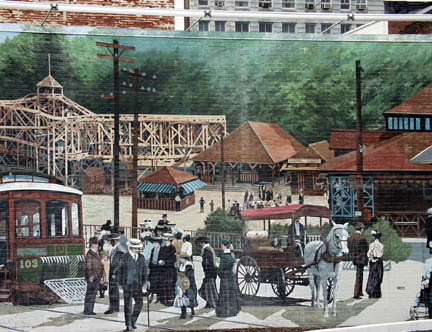 I think I found 15 of the 25 murals located around town. 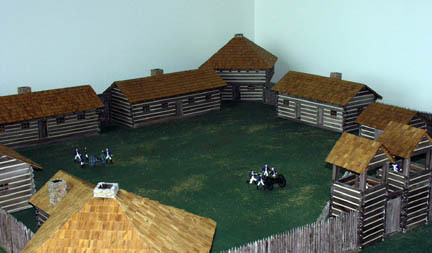 Steubenville is also the home of Fort Steuben. 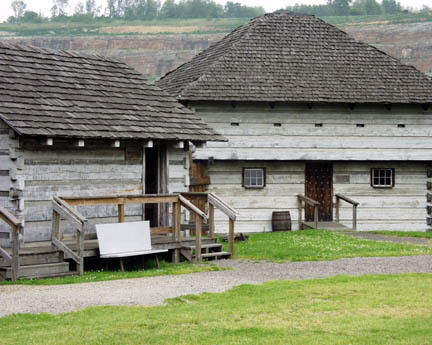 The fort was built in 1786 for the protection of land surveyors who were sent by the Continental Congress to map out the Northwest Territories. 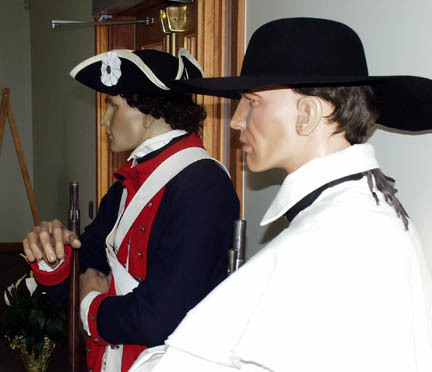 There is now a nice museum and they have built a replica of the fort on the grounds. 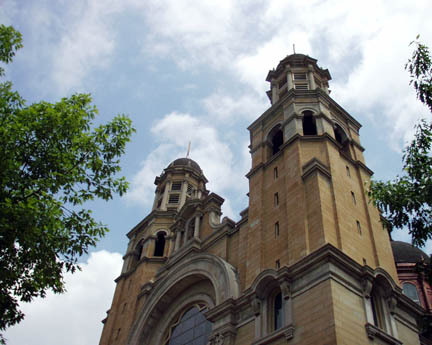 There was one more unique site to visit in Steubenville. That is the "Ohio Valley Steelworker" statue. 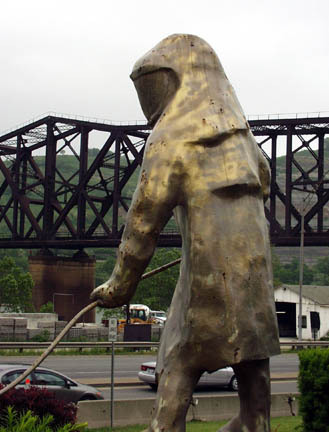 This statue was created by artist Dimitri Akis as a tribute to the Ohio Valley Steelworkers. The life-size figure carries a long-handled dipping ladle, and is wearing the hooded fire-proof suit worn in the steel mills. 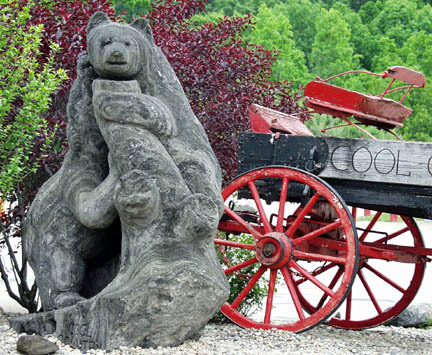 The statue is located at the junction of Hwy 22 (University Blvd) and Hwy 7 (Dean Martin Blvd). I spent about 1 1/2 hours in Steubenville and had to get back on the road north. I eventually made my way to East Liverpool, Ohio, clear up at the top of the W. Virginia panhandle. I found it funny tat as I entered E. Liverpool, a song by George Harrison of the Beatles, "What is Life?" came on as I listened to my iPod. Just a little thing, but out of nearly 10,000 mp3s a Beatle comes on as I enter a town named Liverpool. 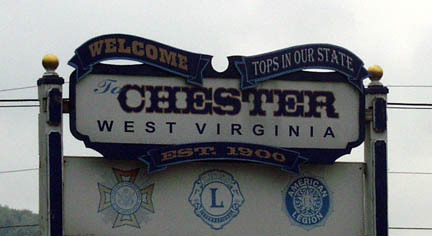 Anyway, I crossed over the bridge into Chester, W. Virginia (Motto: Tops in Our State) to see one of my "Biggest in the World" things. This time it is a giant Teapot. 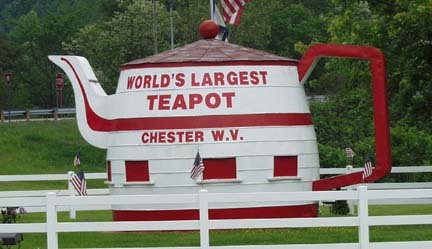 Touted as the "World's Largest Teapot", it was originally built in 1938 as a giant hogshead barrel for Hire's Root Beer. 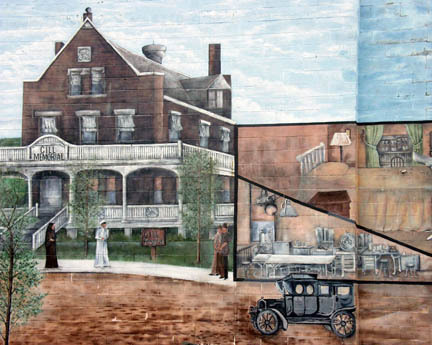 It later had a souvenir shop inside of it to sell local pottery and crafts (E. Liverpool is famous for pottery). Over the years it led a helter-skelter life only to finally be saved by some local citizens. It is now owned by the city of Chester and has been refurnished inside and out. 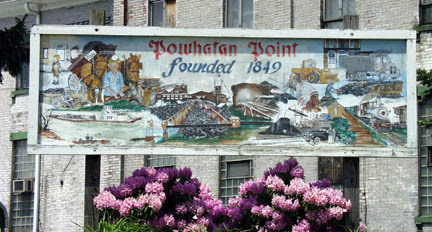 It was dedicated in 1990. 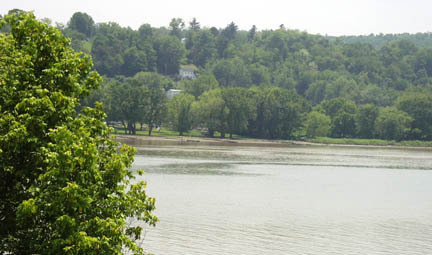 From Chester, I crossed back into E. Liverpool and headed east towards the Allegheny River, which I planned to drive along and then eventually make my way into southwestern New York. I got onto U.S. 62 and headed east towards Oil City, PA, (near Titusville, PA, the supposed home of the first oil well in North America, though Oil Springs, Ontario also claims this). 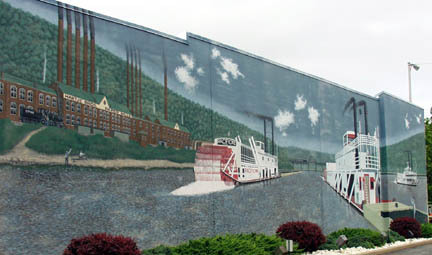 In any case, Oil City later became home to Pennzoil and Quaker State. I continued on towards President, PA a small non-descript river community with a unique name. 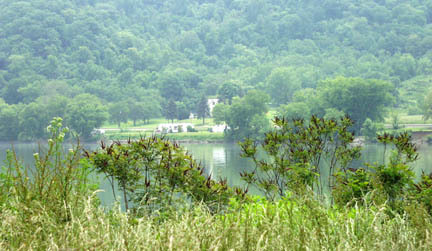 I finally got to scenic Tionesta, PA. Nestled in the Alleghenies, it is wooded with lakes and rivers. As I crossed the bridge I came across the lovely lighthouse scene. I wondered if this was one of the only inland lighthouses. Here is an article about the man who fulfilled his dream of having this lighthouse built. 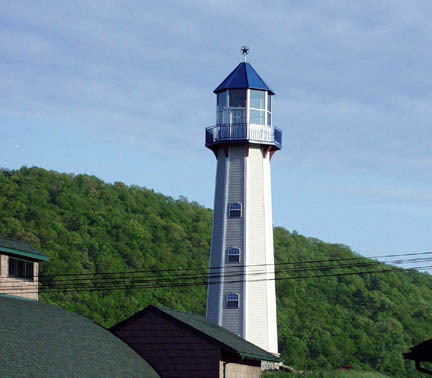 The lighthouse serves as a museum dedicated to lightouses. This turned out to be my last stop along the way. It was getting late so I continued North on US 62 along the Allegheny River, a wonderfully scenic drive, and made my way into Jamestown, NY. By this time it was getting dark but I pressed forward. I stayed on US 62 all the way into Hamburg, NY. 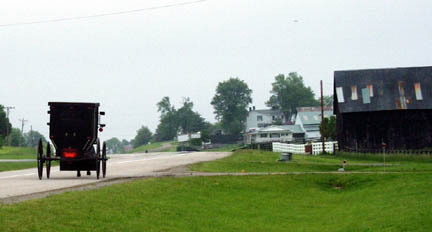 As with other Hamburgs (Pennsylvania and Ontario, for instance), this was Amish country. 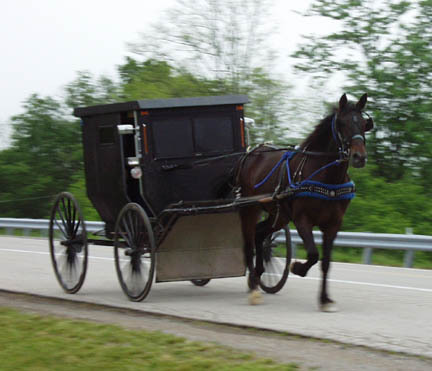 I saw at least three Amish horse drawn buggies with gas lanterns lit up along the way. It was kind of a nice way to end my trip. Once into Canada and back on the 403 heading towards Woodstock, Joni Mitchell's version of Woodstock just happened to come on my iPod...only 10 miles outside of Woodstock. Two synchronicity songs in one day...what a trip!! By the time I got to Woodstock I was half a day exhausted.